We were confronted by the police on the way to our TL2 base camp, Katopa. The commander marched into the Chef Kahodi’s house where we had stopped for a couple hours. 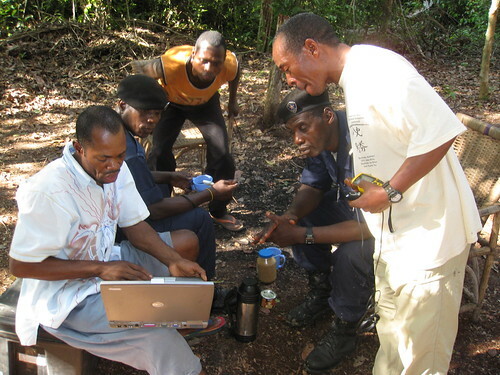 I explained our mission: We are here to find out where the great ape, bonobo, and rain forest giraffe, okapi, exist in Congo’s Lomami forests. And we are here to find out the situation of Congo’s last forest elephants. All three species are completely protected by Congolese law. I am the Project Director and visiting the base camp. We showed our “ordre de mission” from the national capital, Kinshasa. John invited the commander to visit us at Camp Katopa. The police commander listening to our explanations. Several days later he arrived by bicycle with one other police agent. But in the meantime, at Katopa, a couple team leaders explained to us that recently an AK47 had been sent into the forest with expert poachers to kill elephants. What’s more, they said the gun belonged to the police. It was being used with the complicity of high territorial administrators. 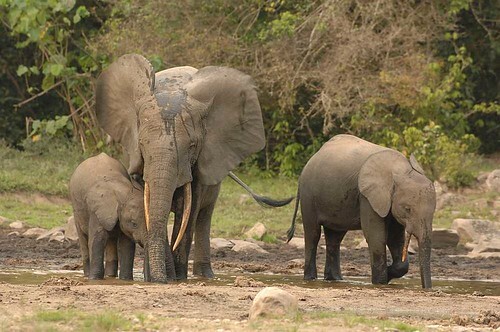 A single group of elephants remains in the Tshuapa-Lomami forest. Probably similar to this small group photographed by Reto Kuster in the Ituri Forest. We knew from our work that there were almost no elephants left between the Tshuapa and the Lomami Rivers. Here, in the Province of Kasai Oriental there had been catastrophic poaching about 10 years earlier, during the war. We also knew that there was one tiny remnant herd of five or six individuals. It was only a matter of time before the poachers found them. I assigned Crispin and Maurice, both fluent in Lingala, the language of the military, to explain to the police commander how we work. He was fascinated with their demonstrations of GPS, thuraya, compass, and computer downloads. Crispin and Maurice led an impromptu training session for close to two hours. 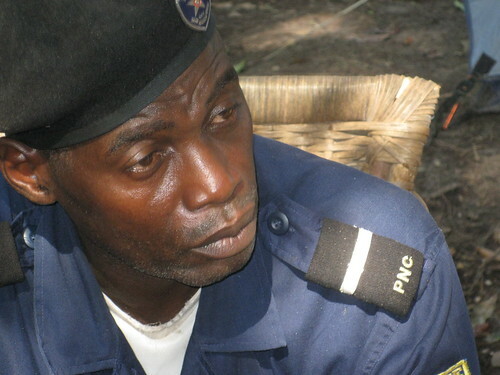 When I left Camp Katopa the next day, I passed the commander at Bamanga, the first village just 15 km from Katopa. Maga, our rations organizer, was in the village buying palm oil and fufu. He explained to me that the poachers were already here. My heart sank, we had just passed elephant tracks on the path. The next two days I spent in the territorial capital of Katako Kombe. On the way back I stopped again at the Chef’s house in Kahodi. My motorbike had barely drawn up, when I saw the commander crossing the path to see me. “We arrested an elephant poacher in Bamanga, near Camp Katopa and the AK47 is in our possession”. I did not need any more details. I did not need to say that I had been told the AK47 had been in his possession in the first place. His intentions were clear. I thanked him and left for Kindu greatly relieved. This entry was written by Terese Hart, posted on 2008-11-12 at 8:42 pm, filed under Elephant. Bookmark the permalink. Follow any comments here with the RSS feed for this post. Post a comment or leave a trackback: Trackback URL. Terese, great post. You make me miss the forest, the good guys, the bad guys, and the whiskey at the end of the day. Ok, back to homework in France !